Evacuees fill up cots Monday at the George Brown Convention Center in Houston, which has been turned into a shelter run by the American Red Cross to house victims of the high water from Hurricane Harvey. Experts say it's best to donate money, not items or services, to trusted charitable organizations after a disaster — and to keep long-term needs in mind. Disasters like the flooding that has followed Hurricane Harvey, displacing thousands of people, always create a tremendous need for help — and a tremendous desire to provide that help. But those who have dealt with disasters before say people need to be careful about how they contribute to disaster relief, and when. Cash donations are almost always preferred over items — such as blankets, clothing and stuffed animals — often sent into overwhelmed disaster areas by well-meaning donors. Nonprofit groups say in this case that they're also preparing for an extremely long recovery, and that the needs almost certainly will change over time. Still, there's been an immediate outpouring of aid, even as flooding continues to devastate areas of Texas and threaten Louisiana. The American Red Cross, the Salvation Army and other groups already have received millions of dollars in donations to provide shelter, food and other assistance to flood victims. And almost 300 online GoFundMe campaigns have raised more than a million dollars so far to help individuals and families affected by the storm. Houston Mayor Sylvester Turner has also set up a special Hurricane Harvey Relief Fund, which is accepting tax-deductible donations. Turner says he did so in response to an overwhelming number of calls from people around the country who are eager to help. He says his city's needs are extensive. "We've asked some of our business partners for things like diapers, baby formula," he said Monday. "We've got kids, babies. We've got all the way up to senior citizens. 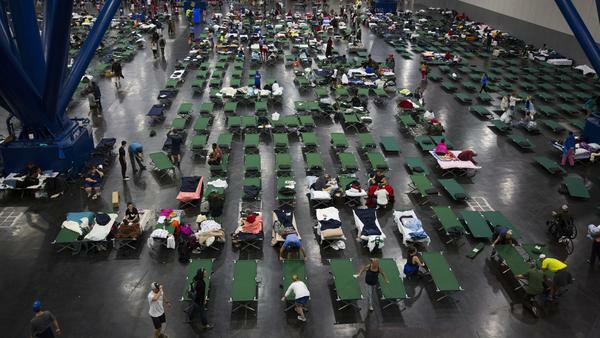 And they are needing everything — they're needing clothing, food, medical supplies." But Bob Ottenhoff, president and CEO of the Center for Disaster Philanthropy, has some words of caution for those who want to help. "This is not the time to be donating products or even services," he says. "That's frequently the urge, and most often that is the wrong thing to do. ...With the floods blocking off streets, when warehouses are not available, there's no place for these products — there's no place to store anything, there's no place to distribute anything. And that's going to be the case for some time." Instead, he says, people should give money to groups they trust, and that have the ability to provide aid where it's needed most. Derrick Chubbs, president and CEO of the Central Texas Food Bank in Austin, agrees that cash donations are best for groups like his, which is trying to help with emergency food distributions. The Houston food bank — the largest in the country — has been shut down by flooding, so others in the state food bank network are pitching in. "I say donate funds, because we can use those to purchase exactly the type of disaster relief supplies that are going to be most helpful," Chubbs says. "It also avoids complications of sorting and having to distribute varied types of food items." Nonprofit disaster relief groups also worry that people who respond immediately to the disaster will lose interest in the weeks and months — even years — ahead, when victims will likely need just as much help, if not more. "This is going to be a long-term event. We're going to be there for a long time," says Lt. Col. Ron Busroe, the Salvation Army's community relations and development secretary. Right now, his organization is trying to provide immediate relief to flood victims, including opening up some of its facilities as emergency shelters. They also have almost 60 mobile kitchens ready to deploy around the disaster area as soon as roads are opened. But like others, Busroe knows they'll likely have to provide food and shelter assistance well after the flood waters have receded. He predicts this disaster will affect more people and property than Hurricane Katrina did in 2005. Ottenhoff's group was created after that disaster specifically to encourage more effective giving. He says that disasters have a life cycle — and that even if the urge is to give right away, it sometimes makes more sense to wait and see where the needs are greatest. Long-term donation needs might include construction of permanent housing, job placement help, even programs to help communities be better prepared for future disasters — but every event is different, and can produce unexpected funding gaps months or years later. Eventually flood victims will have to go back to their homes and rebuild, Ottenhoff says, and "this is often the part of a disaster that doesn't get media attention and therefore doesn't get donor support." He adds that later on, it might make sense to give to a different kind of group than you would support in the early days of a disaster. "There are some organizations that would be really great at providing a kitchen to give people some food and drink, and might give you a temporary housing solution," he says. "But a month from now, when we're beginning to do the muck-out in the houses, or we're beginning to think about long-term housing needs for people who may need a place to stay for three months or six months, there may be other organizations that are better at that." Ottenhoff suggests that people might want to give some money now for immediate relief, but save some of their charitable dollars for later, when they might have an even greater impact.